It’s GOTV weekend! The Primary Election is this Tuesday, so this weekend is our last chance to reach voters. Will you pledge to remind 25 voters you know to vote for me by Tuesday, June 5? You can also send our supporter letter to your email address book. Many voters may not be aware that there is an election this week, so your reminder is important. In a busy election year, many voters are not following the Superintendent of Public Instruction race and remain undecided on who to vote for. Will you pledge to share our campaign ads on your Facebook and Twitter everyday until Election Day? You can share this one, this one, or this one on Facebook. Voters who have seen our TV commercials come up to me all the time in public and tell me how our message is resonating with them. Will you pledge to contribute $50, $100, $250, or $500 to our campaign today to keep my commercials on the airwaves? Thank you for actively supporting my campaign in these critical final days, and thank you for supporting great candidates across our state. Onward to Election Day! For the first time, the CDP has launched our Promote and Protect The Vote (P2TV) Hotline for the Primary. We will have a team staffing the hotline to respond to any reports we receive of improper voting practices, voter intimidation or other issues. Click here for a comprehensive overview of the P2TV Program. The P2TV Hotline will be open to callers from 9:00am to 6:00pm starting on Saturday, June 2, and every day, including Saturday and Sunday, through Election Day. On Election Day, Tuesday, June 5, the hotline will operate with extended hours starting at 6:30am through 8:00pm. Sacramento County is one of the five counties participating in the Vote Center pilot project for this Primary – an exciting new way to vote that will make the process of voting much easier and more efficient for voters. Your CDP Team – many of whom are registered to vote in Sacramento County – are helping to get the word our about these exciting new Vote Centers… by voting there ourselves! Watch our video below which highlights all the benefits of Vote Centers, and please share and tag your friends in: Napa, Madera, San Mateo, Sacramento and Nevada Counties so we can help get the word out about this great new way to vote. Months, and in some cases, years, of hard work at every level of the Party will culminate with the vote on Tuesday. This is California’s chance to showcase the strength and depth of our Resistance, and to preview the Big Blue Wave we’re creating to wipeout Republicans in the Fall. Let’s make sure we do everything we can to turn out the Democrats who will get the Big Blue Wave rolling across the Country. Check out cadem.org/gotv for a list of GOTV events, as well as links to our slate card and the P2TV Hotline. Good luck to all of our CDP-endorsed candidates! And a big thank you to everyone walking precincts and making phone calls over the next five days! Every time there is another mass shooting, you hear politicians on both sides of the aisle talk about how their “hearts break”. Those are nice sentiments. But we need action now to prevent gun violence. There are 10,000 Californians who by law should not have guns. They are serious felons, or people too mentally ill to have a gun, or subject to domestic violence restraining orders. It’s the job of the California Attorney General to obtain the surrender of those guns. We have had over a year and half now under the current Appointed Attorney General. He has failed to do the job. I will make it a priority to take the guns from the 10,000 Californians who by law cannot have them. Just one of these 10,000 could cause horrible carnage. 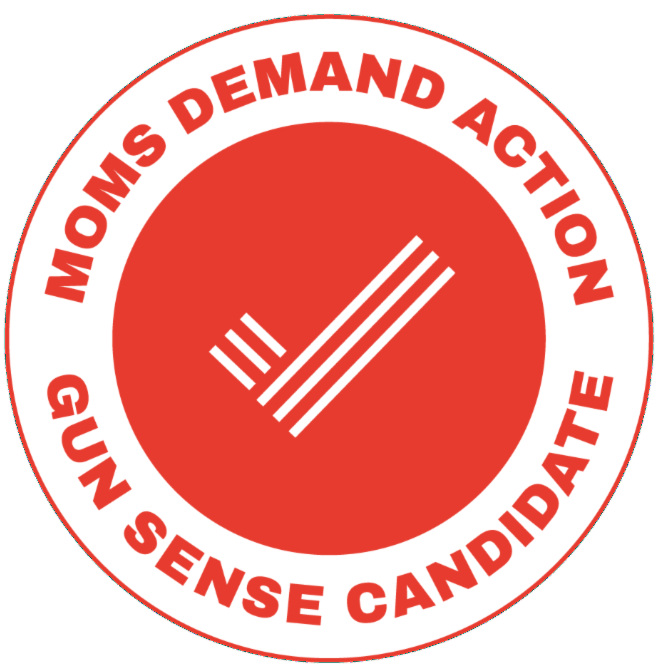 I am proud to have received the official Gun Sense Candidate distinction from Moms Demand Action! This important grassroots gun prevention coalition knows that I will take action to prevent gun violence. Resisting Trump when he attacks California and our values is important. I will use my 30 years of legal experience to resist Trump. But there is much more to the job of Attorney General than resisting Trump. And it’s not getting done now. Today is Gun Violence Prevention Awareness Day. Please take a moment to share on social media your support for gun violence prevention. Please also support my candidacy for Attorney General to elect an Attorney General who will do more than express sentiments – who will make it a priority to do the job and take guns from the 10,000 who should not have them. Please share this email with your friends, colleagues and family. Post it on your social media. Please encourage others to vote for me. Thanks again for your support. This evening marks the beginning of the last weekend of this campaign before the June 5 primary and our truly critical fundraising deadline. We’re almost there, but we still need 250 new donations to hit our goal of 2,000 donations. We also must do more to ensure every progressive turns out and votes for Kevin. If we don’t take these next 4 days seriously, we may have to scale back our voter outreach program — a huge setback with just 4 days until our primary. Unlike our opponents, we’re funded by small dollar contributions from grassroots donors like you. Our success on Tuesday will be 100% because of you. We have the chance to make history together — please add your contribution and take the actions above to make it happen today. As a dad, my heart breaks for every parent who has lost a child to a school shooting or to gang violence. As California’s chief law enforcement officer, I have prioritized gun safety. But today, on Gun Violence Prevention Awareness Day, I need your help. Whether you join a “Find a Wear Orange” event or take to social media, the families of gun violence are counting on us to lift up gun safety solutions, and explore what more we can do to keep our families safe. Can you chip in $5 to support some critical gun safety efforts already underway? In California, we’ve taken on the NRA and won. Our special agents confiscate illegally held weapons around the clock. Some days, they enter homes expecting to find a few illegal weapons and instead find dozens of firearms and thousands of rounds of ammunition. But there’s more we can do to prevent the next mass shooting. My team is in touch with lawmakers, community leaders, advocates, families who have lost loved ones and our local law enforcement, to explore every option possible. Will you give $5 today to support our gun safety efforts? We need to ensure everyone affected by gun violence — or with an idea to prevent the next tragedy — has a voice. We have just five days until election day! If you haven’t turned in your vote-by-mail ballot and have any questions, watch this short video. 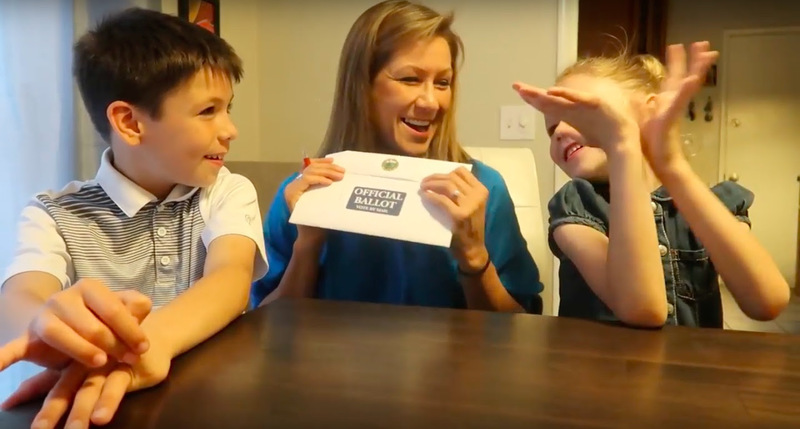 I’ll explain the ins and outs of voting by mail — with some help from the kids, of course! Click here to watch and share, and remember to turn in your ballot by election day or vote in person on June 5! 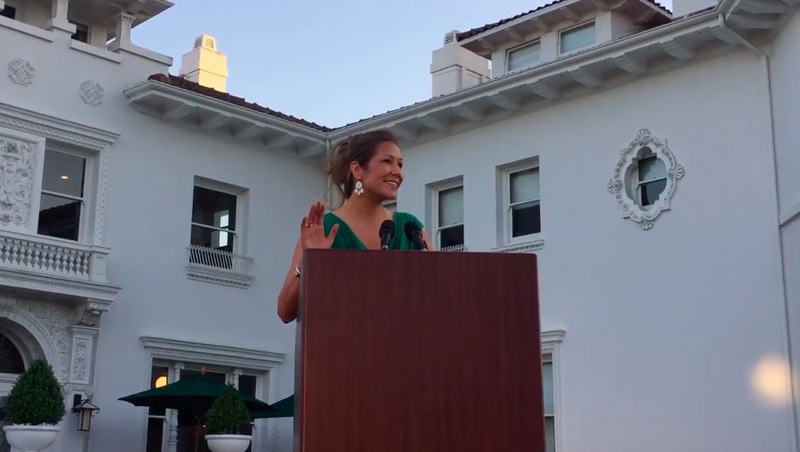 Amanda Renteria is running for Governor in California — because it’s time for new voices who can change the culture of politics. Amanda recently stepped down as Chief of Operations for California’s Department of Justice. She is the daughter of former farmworkers in the Central Valley who went on to attend Stanford and Harvard. Since beginning her career in public service nearly two decades ago, she has served as a high school teacher, a budget analyst in one of California’s largest cities, and the first Latina Chief of Staff in history of the United States Senate. It’s time to inspire a new generation of leaders and build a California ready for the future. Click here to donate if you agree. I’m about to leave campaign HQ, but I wanted to send you a quick note before I hit the road. Between now and Election Day (Tuesday) it’s going to be all-hands-on-deck — locking in last-minute endorsements, attending meet and greets, and talking face to face with as many voters as we can. While David Valadao sticks to his business-as-usual of rubber-stamping Trump’s agenda and collecting PAC checks — I’m going to stay focused on the issues that matter — like job growth, stopping Trump’s trade war, and making sure folks here have access to affordable health care. This campaign is built on grassroots support from folks like you — no corporate PACs, no Washington special interests. We’re close to hitting our end-of-month fundraising target — just 31 donations to go. Can you chip in to put us over the top? I know I can count you. Thanks. Hope to see you soon. We are only five days away from the June 5th – Election Day. And here is why the Attorney General race matters a lot. Californians have a distinct choice as to who will protect the state against the Trump administration, undertake criminal justice reform, and who will best accomplish the many tasks that are vital to the office of Attorney General. There are sharp differences between the two Democratic candidates in the race – California Insurance Commissioner Dave Jones and appointed Attorney General Xavier Becerra. Will you forward this email to 5 of your friends and family to inform them of the key distinctions between Jones and Becerra? ❏ Xavier Becerra funded his campaign by accepting donations from insurance, tobacco and oil companies. Dave Jones has not taken one cent from insurance, tobacco or oil companies. Unlike Becerra, he has signed the pledge to continue to not accept any oil money. Xavier Becerra refused to sign the pledge and has taken $14,600 from Phillips Petroleum and $7,300 from Chevron. ❏ Dave Jones opposes the death penalty. Xavier Becerra supports the death penalty. ❏ Xavier Becerra has failed to collect guns from ten thousand Californians who are under court order to surrender them because they are convicted felons, too mentally ill to have a gun, or subject to a domestic violence restraining order. Dave Jones will make it a priority to get all 10,000 to surrender the guns they have illegally, stand up to the NRA, and fight for gun safety. ❏ Xavier Becerra did not practice law for 26 years prior to his appointment. Dave Jones has 30 years of legal experience fighting for California’s families. ❏ The Attorney General manages over 4,000 lawyers and other personnel. Dave Jones is the only candidate who has led a law enforcement agency for over seven years. Xavier Becerra has never led a state agency, let alone a law enforcement agency, before he was appointed as Attorney General. Xavier Becerra has surrounded himself at the Attorney General’s office with political appointees not licensed to practice law in California. His Chief Deputy, the number two ranking official in the Attorney General’s office, is not licensed to practice law in California. Dave Jones has not as Insurance Commissioner and will not surround himself with political operatives whose role is to insulate the Attorney General from tough decisions. Please don’t forget to spread the word by forwarding this email to at least 5 of your friends. The choice is clear. 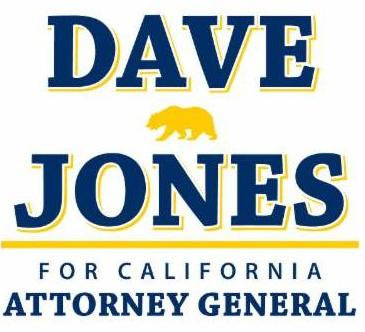 Vote Dave Jones for Attorney General! I know it sounds crazy – how could Tony Thurmond, endorsed by the Democratic Party, Los Angeles Times, and teachers, lose his race for Superintendent of Public Instruction? Well, here’s how: any candidate who gets 50%+1 on June 5 will win outright. And right now the billionaires are spending $8.6 million – a record-smashing amount – to attack Tony and elect his opponent. These same billionaires opposed Proposition 30, which raised taxes on the very wealthiest Californians to fund public education. Because their money is on the line, they will spend as much as possible to defeat Tony, a progressive who believes billionaires should pay their fair share to educate California’s kids. We know that if voters hear Tony’s message, we win. But this is a down ballot race and the fact is not that many people are paying attention to the Superintendent of Public Instruction election. The time is now. Election Day is just 5 short days away. Help elect the clear, democratic choice for all of California’s public school students – Tony Thurmond. It’s been another exciting week on the campaign trail, with new endorsements from Women for Justice, Chico News and Review and Oakland City Councilmember-at-large Rebecca Kaplan. The momentum is building. First of all, thank you to all of you who have given so generously. Because of your recent support we are airing our ad in markets all over California. I am asking those of you who have not to please give what you can as we plan our last ad buy these next few days. Please give here today. Delaine will return to Union City tonight at 5pm, where her political career began, for the launch of the final GOTV (get out the vote!) push and a send off from elected and community leaders — if you are in the area, please join! Thank you for all you are doing. Please continue your outreach with friends and family, and let me know if I can get you any materials to help (palm cards, bumper sticker, etc). Help me fight back. Chip in now to help us fight back and Get Out the Vote. I’m not for sale. The governor’s office shouldn’t be either. But outside groups are raising “unlimited dollars” in dark money from special interests to try to buy this race for Gavin Newsom and Antonio Villaraigosa. If we don’t break through all the noise and stop them right now, they could actually pull it off. Will you chip in before tonight’s end-of-month deadline to help me fight back and Get Out the Vote on Tuesday? In just five days, the primary election will be over. There won’t be any do-overs if we don’t hit our goal tonight or if we can’t reach the voters we need to make it to the general election. We’ve all worked too hard to let a handful of special interest billionaires and corporations buy this race out from under us. I’m fighting back, and I hope you will too. Chip in now, and make sure Californians have a governor they can trust. Thanks to all who have supported my candidacy for Attorney General! Email today at least 5 friends, sharing your support for my candidacy for Attorney General. Share your support on your Facebook page. Share your support on your Twitter profile with the hashtag #DJ4AG. Like my Facebook pageand share my posts! Share this videowith at least 5 friends. Make a contribution of any amountto help us keep our radio ads running. VOTE FOR DAVE JONES FOR ATTORNEY GENERAL ON JUNE 5th! I know that many will be unable to join us due to distance, but I would like nonetheless to invite you to join us to watch the election returns with me and my family and other supporters in Sacramento – but only after you have voted! What: Light appetizers and beverages and election returns! To make sure we have an accurate head count, please RSVP to teamdavejones@gmail.com. There are only six more days left. PG&E is funding campaign ads designed to knock me out. Please take the actions above today. And make a plan to drop off your vote by mail ballot or mail it this week or to vote on Tuesday, June 5th! As former COO of the California Department of Justice, I’m proud of the times that we went up against the Trump administration, defending our values, and winning. But after a year on the frontlines of the resistance, I knew that we could be doing more. California is special, and we can actually lead the nation by example. We need to be pro-California. Click here to watch and share our video, and thank you for being a part of this movement. As I see it though there’s nothing frivolous about fighting to defend our families from harmful policy that risks our health and wellbeing. Dreamers who lawfully applied to live and work in the U.S.
It’s pretty simple: In California, we often stand to lose more than Americans in any other state by Trump’s reckless action. California is 40 million people strong, and the fifth largest economy in the world. Will you give $5 to support these fights underway for our families? With Republicans running Washington, the courts are increasingly becoming our best hope for change. And in California, we’re not just fighting — we’re winning. We’ve had at least 14 legal victories in the past year. Can I count on you to stand with me? Thanks for anything you can contribute today. And there’s more work left to be done. My bills to tax private prisons to fund preschool and to expand STEM education, among others, will head to the Assembly floor soon. By investing in educators and increasing funding for programs, we’re fighting to close the achievement gap for special education, bilingual, and minority students. Ultimately, your support for my campaign will allow me to do even more for public education as State Superintendent of Public Instruction. Will you make a contribution today to help me do more for our kids? I’m running to fully fund our schools, keep students safe, encourage creativity and critical thinking in the classroom, and prepare all of our students for the jobs of tomorrow. You can read my policy plan at www.tonythurmond.com/tonys-plan.